A drawing in ink and wash. I started out, planning this to be a painting, but somehow it ended up as a sketch with a wash. I chose the wrong day to do a painting…a bit low on energy that day. I used one of my photographs I took on my recent trip and it can clearly be seen in this sketch – it is lifeless and without feeling, without energy. I find that I cannot do a sketch from a photograph, somehow I don’t have the ability to give it …oomph..
Ronelle, I think you’re being a bit too hard on yourself. This is a great sketch! The sketch is a nice reminder of your trip and what you saw that particular day. When you look at this weeks and months down the road, you will be reminded of that day. I like this. 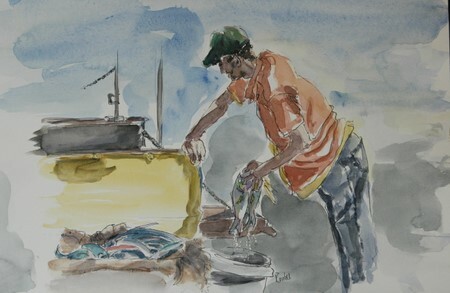 I can make a story from what I see in the sketch: what the fisherman is doing or thinking, what he might do next. It’s a wonderful sketch! From here, this looks active, vibrant, spontaneous – everything a sketch should be! I don’t see what you don’t like about it. This is beautiful work, Ronell. MY ABSOLUTE FAVORITE IS PEN AND WASH AND HTIS HAS THE VIVID SPONTANEITY THAT MAKES THAT METHOD SO GORGEOUS! I THINK IS THIS GLORIOUSLY DONE! thanks for the comments…I do feel better about the sketch, Thanks! hi ronelle thanks for visiting my blog so that I could get to yours! I love this sketch. It’s very loose and energetic. Of course we have to work from photos every now and then. There’s no way I could ask everyone that I wanted to paint to hold the pose for twenty minutes. Can you imagine asking the fish guy to just hold it for a minute? Plus, I love the self portrait that you have in your profile area. Very wonderful!